We show you the weather now as well as today’s weather in Algorfa, the latest current temperature in Algorfa and the conditions in Algorfa i.e. sun, cloud, rain, overcast, clear, etc as well the humidity, pressure, wind direction and wind gust strength. You can click on the graphic and get a much more detailed weather outlook including: tomorrow’s weather in Algorfa, long range forecast, a weather map showing any pressure systems, visibility, UV, pollen count, dew point, where the weather station providing this data is located, a 5 day, 7 day (week forecast), 14 day, 15 day and 10 day forecast for Algorfa weather. This page gives you information on all aspects of Algorfa weather. We have a description of Algorfa’s climate, we have today’s weather, we have up-to-the-minute current weather temperature for Algorfa as well as a more detailed 10 day forecasts for the weather in Algorfa. Algorfa is an inland market town located on Spain’s southern Costa Blanca. 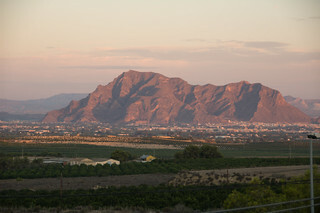 Algorfa belongs to the Vega Baja del Segura’s citrus farming villages and lies on the banks of the Segura River. Algorfa is a thirty minute transfer to both Alicante and Murcia airports and is fifteen minutes away by car to the busy sea side resort of Guardamar del Segura. The main tourist draw to Algorfa is the golf course, Sunday market and the neo gothic church which was built at the turn of the nineteenth century and is situated just outside the town of Algorfa. The golf course in Algorfa is one of the finest on the Costa Blanca and the La Finca Golf Course is located on the urbanisation of La Rellana, and is an eighteen holes par seventy-two course with a five star spa hotel. 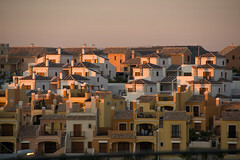 The nearby urbanisations of Lo Crispin, Montemar and Montebello have an abundance of villas, apartments and townhouses for rent throughout the year. Algorfa has what is known as a Mediterranean climate meaning that the months of June July and August i.e. the summer months are hot and humid without any rain. Accommodations with ceiling fans and air conditioning are highly recommended. The autumn months of September, October and November are generally hot too but without the humidity. The swimming pool and Mediterranean Sea are still filled with bathers. It is during the months of September and October that Algorfa may experience the dreaded Gota Fria meaning the cold drop which signals in cooler weather. The Gota Fria is experienced as a major storm that can cause a lot of damage and flooding. The subsequent weather never quite reaches those highs of the summer until the next year. The winter months of December, January and February are the cooler months where the mornings can start out at around seven degrees centigrade but temperatures do soar into the twenties. This is also the time that rented accommodations or homes could do with the central heating being turned on. The spring months of March, April and May herald in warmer yet unpredictable weather. Sometimes shorts and t-shirts suffice while on other days jumpers and jackets are necessary. Whatever time you choose to visit Algorfa you will always have the weather with you.